Jhack Tepora woke up this morning and weighed himself in his hotel room in Las Vegas. He was 132 pounds. That is not a big deal for a regular 5’6 guy in his mid 20’s but Tepora isn’t a regular 25 year old guy this week. The Cebuano will be fighting in the first mega boxing event of 2019 as an undercard to his iconic countryman, Manny Pacquiao at the MGM Grand Garden Arena this Saturday night. The undefeated Tepora (22-0, 17 KOs) will be exchanging punches against former title challenger Mexican Hugo Ruiz (37-4, 31 KOs). Their bout is for the interim World Boxing Association featherweight championship. The contracted weight for that fight is a max of 126 pounds. But Tepora is confident that he will lose the extra poundage before the official weigh-in tomorrow afternoon. Tepora assured the Philippine media men who are covering the event that he can make 126 in the next 24 hours. “Magpapapawis lang (I will sweat it out),” said Tepora. He also won’t be planning to grace the famous buffet lines of Sin City today. In fact, he only intends to drink water today and tomorrow. This isn’t the first time Tepora had some weight issues prior to a big fight. He mentioned that he was in the same situation in his prior fights and that his body is used to this regimen. He also mentioned that he has no plans or moving up on weight as a result of this. According to anonymous sources, Tepora arrived in the US last week at 148 pounds. And there are concerns that he might not lose the necessary pounds prior to the weigh-in. Today, he is down to his last six. 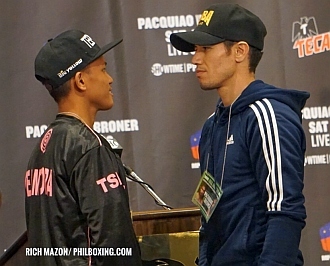 Tepora and Ruiz faced each other Thursday afternoon for the final press conference of the undercard bouts for Pacquiao and Adrien Broner. Both fighters sized up each other before they meet each other again tomorrow at the weigh-in and on the ring on Fight Night. Afterwards, Tepora went straight to the sauna of the MGM Grand Garden to accomplish his first goal before defeating Ruiz — lose weight. You can reach the author at rrmaze24@aol.com and @Freemazon910 on Twitter.